I love eating out. It doesn’t matter which meal, breakfast, lunch, dinner or après, I’m keen. The glitch in our household is that my husband, whose work keeps him on the road for 140 days a year, finds home-cooked more a treat than restaurant dining. It’s not always easy to convince him to go out to eat — unless it means eating out in Golden. For the small size of our town, we have many incredible choices. And with good value. Another thing my husband and I both love about Golden’s restaurant scene is that wherever you go the atmosphere is always warm, friendly, casual and inviting. 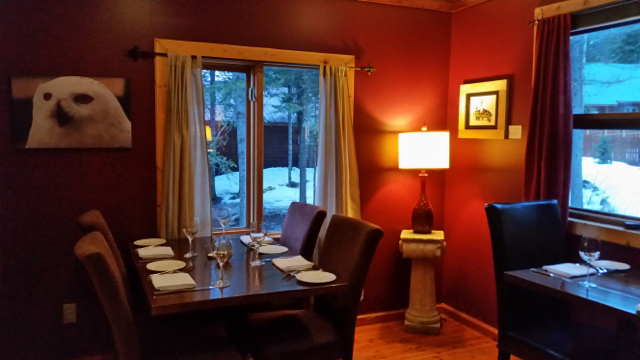 The reason we haven’t yet tried Eagle’s Eye is because the Cedar House Restaurant, Golden’s other casual fine dining establishment, is just so darn perfect. It’s also close to our house. Nestled in the woods alongside the Cedar House Chalets, the Cedar House is where you go to get that warm and cozy kind of mountain experience. Corey (the Chef) and Annie (operator/general manager) took over the restaurant last spring. They’ve added their own special touches to an already-special restaurant. Corey always offers a delicious amuse-bouche to prep the palate, along with freshly baked bread and homemade butter. And, this isn’t just everyday bread and butter; it’s always got some kind of interesting twist — on the butter side we’ve tried spiced rhubarb, cranberry infused, and rosemary herb. The menu is what you’d expect from a restaurant that captures Trip Advisor’s top spot for restaurants in Golden and 8th place for of the nearly 14,000 restaurants in all of B.C. Yup, it’s delicious, interesting, artistic, and everything is made with the highest quality ingredients – sustainable seafood, natural and antibiotic free meats, organic produce — that are as fresh and local as possible. Our daughter even spent a couple of Sunday afternoons last summer weeding their expansive garden. If you enjoy a cocktail, you’ve got to try one of their signatures. I recommend either the Cranberry Smash (a mix of vodka, cranberry, fresh orange, cloves, brown sugar, apple juice and a touch of ginger beer), or the Maple Whisky Sour (a mix of Canadian spiced whiskey, real maple syrup, fresh lemon juice, orange peel and a rosemary sprig). Both are delish. From the menu, makes sure someone in your party orders the risotto. Corey’s risotto is the best I’ve ever had anywhere (my main point of comparison: I once had risotto at one of Batali’s fancy New York restaurants, and it was nowhere near as good as Corey’s). As for our other favourites, The Island is where we go most often. We love the menu’s variety, quality of food, and especially the value. Owners, Petra and Aaron — he’s a born Goldenite, she hails from Australia — have created something truly special here. With its rustic log house setting, right on the river (there’s an incredible second floor summer patio), an inviting upstairs dining area for parties or events, the menu never fails to satisfy. Our daughter’s favourite dish is the Island Burger. It rivals the Wolf’s Den for best burger in town. Our son is always all over the calamari — curry fried, yum. My husband’s a fan of the veggie pizza, but also can’t resist ordering the Geschnetzeltes once in a while (don’t worry, you don’t have to be able to pronounce it to order it). 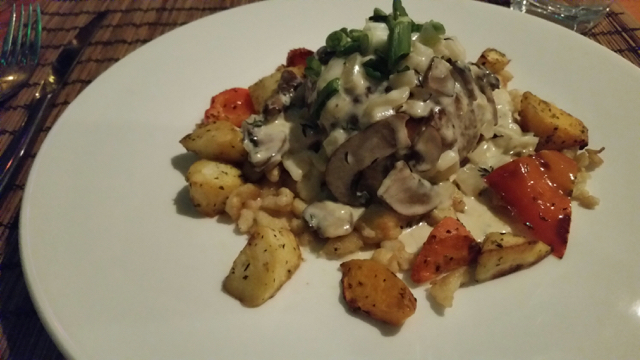 What’s not to love about sliced buffalo in a creamy mushroom brandy sauce, served with rosti potatoes and veggies? I’ve had the Geschnetzeltes before; trust me, there’s nothing not to love about that dish. Typically, I opt for the Lentil and Chickpea Curry, a yummy vegetarian dish, one of my favourites anywhere. On our most recent visit I tried a new item, the Elk Rissole. It’s one of the Australian-inspired entrees. It’s kind of like a stuffed meatloaf with Cambazola cheese and a mushroom thyme cream sauce, served with spatzle and veggies. The rissole was so good I was tempted to go back the next day to have it again. In addition to the regular menu, The Island also does a Mexican Madness special menu on Mondays and more recently a Thai special menu on Thursdays. Oh yeah, and they’re open for breakfast too. Eleven22, another of our favourites, is located in a renovated turn-of-the-century house, which gives it a cozy, modern-quaint type of feel. I think of Eleven22 as the most fusion-inspired menu of the lot. The meals are delish (you’ve got to try the Stilton fondue appie) and the daily specials are always outstanding. Because Wednesday is their martini special night (three ounces for the price of two), the Whitetooth Mountain Bistro is my personal favourite for meeting up with the girls for a mid-week meal. The Bistro is probably Golden’s most contemporarily styled restaurant, with its bistro look and feel. The menu is full of interesting, fresh and tasty choices. My favourite is the steak sandwich. It’s nothing like any steak sandwich you’ve ever eaten before. Lastly, for those ‘let’s go for burgers and beer’ nights, the Wolf’s Den is a sure fire win, especially if it’s a Sunday. That’s their live music night, the ‘Sunday Howl,’ a laid-back open-mic kind of evening with great music and a lively, fun, family-friendly atmosphere. They’ve got two menu pages of delicious burger options — everything from beef, to veggie, chicken, game and fish.. Happy dining, from our family to yours! For more information about Golden’s restaurant and dining scene, check out Tourism Golden’s dining page.